I should say “humbled,” but more on that in a minute. I am speechless, though. You like them, you really, really like them! I’ve loved these socks since the minute they came together in my head. But as I began the heel flap, I went over the moon. I hope it’s the same for everyone who knits Jane’s Hedgerows. I’m grateful to Lisa of Wildhorse Farm Designs for being so gracious about the name thing. I love her sock designs, and when I found out that she’s had a Hedgerow pattern for ages, I was, shall we say, mortified. Google is our friend; I should have done some research. And Clara? They don’t call her the Queen Bee for nothing. I love Knitter’s Review for a million reasons, but Clara and her most excellent newsletter are at the top of the list. Then there’s Ravelry…3 projects (one of them is mine, but still) and in 35 queues. And the Tilt and Whirl pattern is already in the hands of all the Spirit Trail Sock club members. ‘Nuff said. So this has been an amazing week. Sock madness and work madness converged and created Jane madness. It was a week of rainy days and frantic vacationers, of not enough staff (and two of them brand new), of too many books to order and receive and shelve, of an unexpected off-site event that coincided with a planned in-store event. The result was general exhaustion and a really painful and sore foot. I’m hobbled. No wonder — I actually spent 12 solid hours in the store on Saturday, at full tilt. Rest is all that I am planning for today. It’s Spirit Trail Fiberworks worsted weight 100% silk, and it arrived on Thursday, the second installment in the Yarns with Spirit club. Shelia’s lacey pattern is a delight, too. Oh my goodness. Thank you, thank you to everyone who has commented or emailed or posted on the KR forums. I am delighted, and so grateful. You’ve helped make this adventure a lot less frightening than I thought it was going to be. I’m going to go knit something (want to bet it will be worsted weight silk, something lacey, perhaps?). In just one week, the Summer Season will be over. I can’t wait for September. I think I can hold out for that long. The Socks are just Beautiful – and the photo’s make me miss Long Island – Born and Raised there – now residing in New Jersey. Thanks for a wonderful pattern and for reminding me of the wonderful shores I grew up on! They’re gorgeous socks, Jane!! 🙂 I hope you have more ideas tucked away. And isn’t the summer madness about to wind down for you??? Everytime I see a picture of the socks, I want to knit them more, especially now that you’ve drawn my attention to the heel flap. But you know I can’t–shouldn’t? Need to buy needles? Need to steal more needles from unsuspecting wips? Only time will tell. Rest up, and remember you’re almost home free–Labor Day is nigh. Jane – you have earned a well deserved rest! Thanks for the close up of the heel. Any chance your Tilt and Whirl pattern will be available for sale? I like that one too! Jane Dear!Your Hedgerows are the classic socks I’ve seen in my minds’ eye for a while now, but I’m not yet experienced enough to construct a pattern for myself! Thank you for making them a reality! 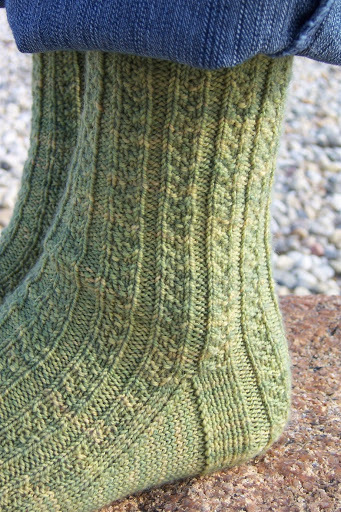 Your Hedgerow socks are beautiful! 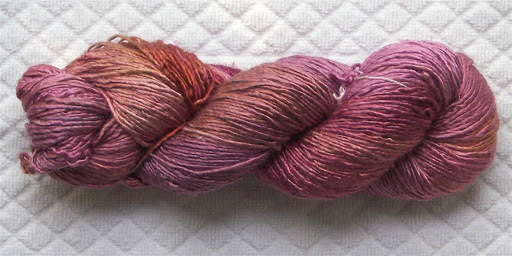 That silk yarn is gorgeous. I’m looking forward to seeing how it knits up. Just another week until Labor Day and, hopefull, things will calm down for you. woowoo girly – only 1 more week to go.thinking of you. missing you. lovin’ the socks. congrats on your sensational sock pattern! it should be a hit, since it’s gorgeous! I can’t wait til my hand is all healed so I can knit some up.Hey… only two days til labor day… yahoo! Ooh, I can’t wait to make some! I “accidentallY’ found your blog after finding your hedgerow pattern. You instructions are superb. I’m somewhat new to sock knitting (since February) and the way you constructed AND explained the heel was wonderful. MY hedgerows in Dream in Color Wisterious are a wonder to behold–Thank you.